The dynamic new book, Magician's On Ice, is one of the best written sports sagas of all time. The book is thoroughly researched and expertly written by a brilliant young author named, Timothy J. Thompson. 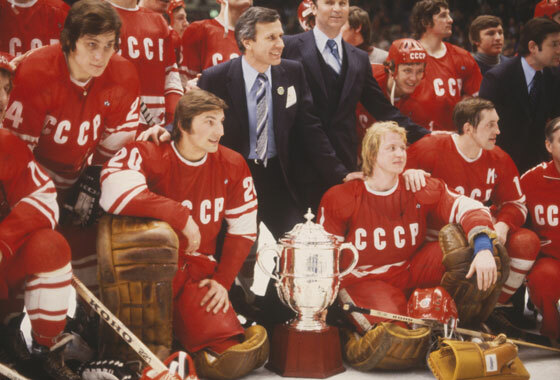 MOI details the very beginnings of the legendary Soviet Hockey Dynasty. Mr. Thompson goes out of his way to show just how superior Soviet thinking, strategy and philosophy was with regard to the sport of hockey. He also discusses their unorthodox, yet highly innovative training methods as well. The second half of the book is really fascinating as Mr. Thompson chronicles each and every game the Soviets played en route to their first International Hockey World Championship in 1956. You, the reader, will be introduced to near flawless goal tending, as well as unprecedented offensive firepower as the Soviets obliterate their opponents and sweep all before them in a series of routes that mesmerized the entire world. MOI is a must read for any sports enthusiast, or hockey fan, of any age or background. If you purchase a copy, it will truly be one of the best investments that you will ever make. THE SAGA OF 40 YEARS OF DOMINANCE!! VOLUME #1 NOW AVAILABLE FOR PURCHASE!! Click HERE To Visit Tim Thompson's Historical Publications Website Where You Can Browse Many Aisles Of The Finest History Books Ever Written!